Es Vedra is one of the most famous landmarks in Ibiza and can be seen on hundreds of postcards. Legend has it that Isla Vedra was once home to the Sirens, who lured sailors to their doom in Homer’s story of Odysseus, and more recently in an episode of the Simpsons. However these days, if you were to visit the Island itself, you would only be greeted by Goats & Rats. 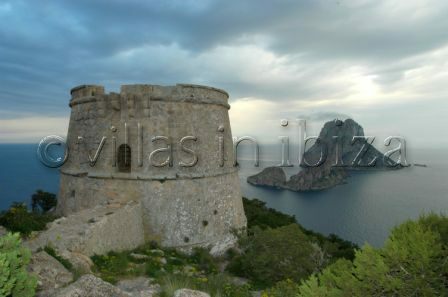 The best place to view Es Vedra is from the Torre de Savinar, the old watchtower that overlooks the island. You can see many of these watch towers around Ibiza, which were constructed between the 16th & 18th century as a lookout for pirates approaching the shore. At one time, these towers were within site of each other. If invaders were sited, a fire could be lit that could rapidly pass the warning to the other towers. To get to the tower, you can park just off the Cala d’hort road and continue along the track to reach a broad area of cliff top. To the left of here is a steep path leading up to the watchtower. This is the perfect place to view Isla Vedra from and the view is breathtaking.